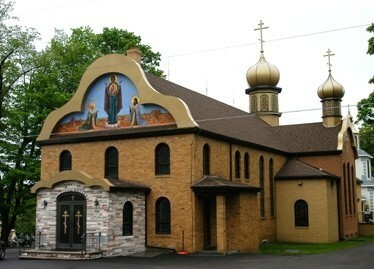 St Tikhon of Zadonsk Monastery is located in South Canaan, PA, a village in the Pocono Mountain area of northeast Pennsylvania, located app. 20 minutes east of Scranton, PA.
Take I-84 west towards Scranton, and get off at Exit 17 (Hamlin). Turn right at the end of the ramp. Follow 191 north for 6 miles to 196 north. Follow 196 north for 6 miles to and turn right at Country Trails store in South Canaan (just past a school). Proceed for 1 mile, and the Monastery is on the left just past the twin ponds (look for the arch). Take I-81 into Scranton, then take I-84. Get off at exit 8 (Mt Cobb), and turn left at the stop sign. Turn right at the traffic light and go approx. 3/4 mile. After passing the sign for the Monastery, turn left onto Cortez Rd (there is a fire station on the right side of the road opposite the turnoff). Follow this winding road for 8 miles, then continue straight for past Country Trails store in South Canaan. The Monastery is 1 mile up the road on the left (look for the arch) just past the twin ponds. Take I-80 west to I-380 west to I-84 east. Get off at exit 8 (Mt Cobb), and turn left at the stop sign. Turn right at the traffic light and go approx. 3/4 mile. After passing the sign for the Monastery, turn left onto Cortez Rd (there is a fire station on the right side of the road opposite the turnoff). Follow this winding road for 8 miles, then continue straight for past Country Trails store in South Canaan. The Monastery is 1 mile up the road on the left (look for the arch) just past the twin ponds. The Monastery serves a complete cycle of Liturgical services; a full list of upcoming service may be found at the bottom of the monastery’s website. If visiting, please call the Monastery in advance as service times may be changed. The following is the general time schedule. A full cycle of services for Lent, Holy Week, and Bright Week are also celebrated. Services are done in English, with some Slavonic. 6:00 AM Midnight Office, followed by Hours and Liturgy (app. 7:00 AM). DURING GREAT LENT, the services are Nocturns, Matins, Hours, and Typical Psalms. 4:30 PM Ninth Hour, Vespers and Matins. 9:30 AM Divine Liturgy followed by Coffee Hour in the Monastery Trapeza [dining hall]. 9:00 AM Hours (Preceded by Greeting of the Bishop if Hierarchical Liturgy). 4:00 PM Vespers. 5:00 PM Compline with the Akathist to the Icon “She Who is Quick to Hear” or other Akathist. Following Vespers, the Akathist to St Alexis of Wilkes-Barre is celebrated. 4:00 PM Vespers and Matins. DURING GREAT LENT, Matins only is served (since Vespers was served at the Presanctified Liturgy earlier in the day). 8:00 AM Divine Liturgy (preceded by Third and Sixth Hours beginning at 7:30 AM). 10:30 Liturgy of the Presanctified Gifts. On Wednesday Evenings during Lent, Compline is served at the normal time of Vespers and on Friday Evenings during Lent, Matins is served in the evening. 9:00 AM Divine Liturgy, preceded by Hours (and greeting of bishop if Hierarchical Liturgy). On minor feasts, time may be changed. Each year at the Memorial Day Pilgrimage, all are invited and welcome to come and share in the joy of the divine services, just as the thousands did at the first such Pilgrimage. Join with us in the age-old tradition of Pilgrimage—a journey to a Holy Place where saints have walked, prayed, and lived. Since the very first pilgrimage to St Tikhon’s Monastery, this annual event has become a time where the hierarchs, clergy, and laity come in great numbers to participate in the prayers and worship. To be present in the beautiful Monastery Church—to participate in the prayers—brings joy, peace, and renewed strength to the soul. All who come are spiritually refreshed and nourished by joining their prayers to those of so many others, as they participate in the sacred prayers of the Vigils, the Divine Liturgies, and Akathist Hymn, and partake of the Holy Mysteries of Confession, Communion, and Unction. Knowing that monasticism is indispensable for the healthy flourishing of a local Orthodox Church, the young Hieromonk, later Archbishop, Arseny (Chagovtsev), who arrived in America in 1902, conceived the idea of starting a monastery in America. In his vision, the monastery would serve as a “mother house” for monastics who were engaged in mission work in various places in North America; they could return periodically for spiritual rejuvenation. Through Fr Arseny’s dedicated efforts, aided by Archbishop Tikhon’s, suitable land was found: the Wagner farm in Western Wayne County, near the village of South Canaan. On June 26, 1905, the land for the new monastery was purchased for $2,580 by Archbishop Tikhon and Hieromonk Arseny—the founders of St Tikhon’s Monastery. An Orphanage was started at the same time. The first Pilgrimage to St Tikhon’s Monastery opened on July 29, 1905. On July 31 the grounds were dedicated by Bishop Raphael (Hawaweeny), and on that day, the first Divine Liturgy was served, in an open place on a knoll where the Monastery Church now stands. A cross was planted on the spot. Bishop Raphael was the chief celebrant; among the concelebrating clergy was Fr Alexander Hotovitsky and very likely Fr John Kochurov as well. In later years these two priests would be martyred in Russia, being formally glorified as saints in 1994. The services that day were in honor of St Tikhon of Zadonsk, who was Archbishop Tikhon’s patron saint and partly for that reason, he was selected as the new monastery’s patron saint. The official opening and consecration of the monastery took place on May 30, 1906. This occasion was the first of the annual Memorial Day pilgrimages. At the opening festivities gifts from Mount Athos arrived: an icon of the Theotokos “She Who Is Quick To Hear,” and one of St Panteleimon; both icons are still cherished by the monastery community. Hundreds of pilgrims from local parishes and from New York carried the icons in a cross-procession beginning at Mayfield. Travelling by train, the assembly was joined at Carbondale by Mitred Archpriest (Saint) Alexis Toth. The pilgrims—whose numbers had greatly exceeded expectations, so that two chartered trains, with twenty coaches filled to capacity—detrained in the forest near the monastery and the church hymns were sung as the procession—with the holy icons—advanced through the woods. After some eighty minutes, the pilgrims caught sight of a blue cupola with a three-barred cross, in the midst of a deep forest—it was the monastery! Fr Alexis Toth, who had been called the Father of the Russian Orthodox Church in America because of his great success in leading Uniates back to the Orthodox fold, was laid to rest in the monastery cemetery after his repose in 1909. Seven years later, his remains were transferred to a specially constructed tomb just back of the sanctuary of the Monastery Church. An eyewitness of this transfer describes Fr Alexis’s remains as being totally incorrupt at the time. As the years passed, increasing numbers of novices came to the monastery seeking spiritual nourishment, as did growing numbers of pilgrims. The Monastery served the Church by its providing clergy for the North American mission, in a time of severe clergy shortage. In turn, the Monastery was supported by the prayers and generosity of many faithful. In 1937 St Tikhon’s Seminary was established on the Monastery grounds. The monastery has, over the years, provided some instructors for the Seminary; this has not only aided the Church’s mission in general, but also the monastery itself, as the availability of sufficient numbers of trained parish priests eventually reduced the need for monks to serve in parishes. The Seminary, in turn, has provided candidates for the monastic life. In the 1950s the Monastery was greatly honored and enriched by the presence of a renowned Orthodox speaker, writer, and leader, Bishop (Saint) Nicholai of Zicha, who spent his last years here and reposed here in 1956. The news, in 1987, of St Nicholai’s glorification brought joy to our Monastery. Three years later, we rejoiced again at the glorification of the Monastery’s co-founder, Patriarch (Saint) Tikhon, and not too long after, in 1992, his well-hidden grave was miraculously discovered in Russia. We have been blessed since then to obtain a fragment of his holy relics. In 1994, the Holy Synod of the Orthodox Church in America proclaimed the sanctity of Fr Alexis Toth. His remains were removed from the tomb in back of the Monastery Church. The service of glorification took place at the Memorial Day pilgrimage that year. The relics now rest in the left kleiros of the Church, in a beautiful, canopied reliquary of carved wood, topped by a bulbed, golden cupola. The monastery has also been blessed in recent years by receiving gifts of holy relics of St Herman and St Innocent of Alaska and St Seraphim of Sarov. We rejoiced at the canonization in 1994 of Saints Alexander Hotovitsky and John Kochurov. Bishop Raphael, who in 1905 served the first Divine Liturgy here and dedicated the grounds, was proclaimed a saint by the Holy Synod in 1999, and his canonization also took place at the monastery at the Memorial Day Pilgrimage that same year. Holy Relics of St Raphael also are housed in the church. The last quarter of the present century has been marked by a renewed interest in things spiritual among young people. This has contributed to increasing interest in the monastic life at St Tikhon’s. Changes have taken place in the population of the community and in outward features of our life, but the inner life, which is the heart of monasticism, continues as before. The unchanging life and rhythm of an Orthodox monastery is centered around the unchanging cycles and seasons of worship, and the fixed nature of monastic community life, with its traditions, rules, and practices. In 1965 the Monastery Church was extensively renovated and expanded, and the present monastery dormitory and dining hall were built. In 1988, to commemorate the Baptism of Russia, a new Millenium Bell Tower was built, as were many other shrines. An addition to the monastery dormitory that same year provided a new refectory and additional space. In recent years, construction has also proceeded on a skete in the nearby woods (a skete is a smaller monastery, usually dependant of a larger one). The St Arsenius of Konevits Skete now has accomodations for several monks, and a chapel is planned. In 1995 the John S and Lucille J Guzey Icon Repository was opened. This wonderful collection not only edifies visitors year-round, but also enriches the Monastery and Seminary liturgical life, as the icons are venerated in our services. The Icon Repository forms one structure with a beautiful new Monastery bell tower which was built concurrently. (Because of structural weakness, the original bell tower had to be replaced). In 1997 the exterior of the Monastery Church was beautified by repairs and other improvements, including new cupolas. By God’s mercy and providence, the prayers and services have been celebrated without interruption for more than nine decades, and the holy oblation has been offered year-round “in behalf of all and for all”—living and dead, men and women, old and young. We welcome pilgrims at all times of the year, and they come throughout the year whenever their schedules permit. Many have felt God’s special presence here, often in a profound, life- changing way. We who live in the Monastery know well the unique blessings that come with life in this holy place, where one may follow one’s attention more intently on the life in Christ. We are conscious of the fact that to live here is incomparably more desirable than to live in the secular life, and we know we have done nothing to deserve all the rich blessings we have received. We rejoice whenever others are able to share in this inexhaustable wealth and in our profound joy by coming to join in our prayers.